Souvenirs of Solitude by Brennan Manning was originally published in 1979, but I can understand why they decided to re-release it. The principles are fresh and new even 30 years later. As a long-time fan of Brennan Manning, I have always read about his spiritual retreats and longed to go to one. I can honestly say that after reading this book I feel like I have been given a taste of that opportunity....and it was awesome! Each chapter deals with a separate subject, and although I read it in one sitting, I intend to re-read it one chapter at a time to allow myself to really meditate on each truth, or souvenir, as the author calls them. At the end there is an eight day retreat guide that I will be using in my personal devotional time this week. The entire book will make a great devotional guide. "In the final analysis, the real challenge of Christian growth is personal responsibility. The Spirit of Jesus calls out a second time. Are you going to take charge of your life today? Are you going to be responsible for what you do? Are you going to hope not because people say you should hope, but because you are confident of vindication? What we do about the Lordship of Jesus is a better indication of our faith than what we think. What the world longs for from the Christian faith is the witness of men and women daring enough to be different, humble enough to make mistakes, wild enough to be burnt in the fire of love, real enough to make others see how unreal they are." What can I say about this book? I found myself on these pages. 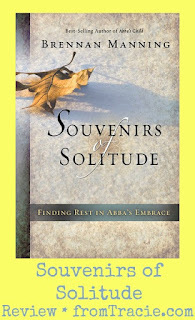 I found Brennan Manning's souvenirs mirroring my own, and those truths calling me back to a place of solitude with my Abba. And I think you will, too. Disclosure of Material Connection: I received this book free from NavPress. I was not required to write a positive review. The opinions I have expressed are my own. I've read Ragamuffin Gospel by Brennan Manning, but I haven't heard of this one. Thanks for sharing it. Have you read John O'Donahue? I think you'd like him. I will track this down. thanks.